Maggie Walker Visual Arts Boosters - What is the VAB? 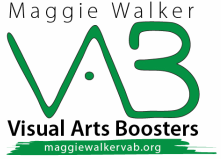 The Visual Arts Boosters (VAB) provide financial and other support for the visual arts programs at Maggie L. Walker Governor's School. Fundraising and other support efforts help to provide students with specialized materials and equipment and unique opportunities for further exploration of art, our local art community, and art-related careers. Field trips, guest artists, a lecture series, exhibits, awards, domestic and international travel, and other unique experiences are all supported by the VAB. Offer support for the art students, their teachers, and the curriculum, which provides unique and essential connections to the overall mission of the school. Raise funds for special materials and equipment, awards, events, and art enrichment opportunities (guest artists, travel, etc.). Provide leadership by offering your ideas and input, on-the-scene or behind-the-scene support, and participation in VAB meetings and/or events. Reach the 100% mark! We would LOVE to say that ALL families with students enrolled in visual arts classes are supporters of the VAB! Would you like to support the VAB and its mission for the art students at Maggie Walker? Don't forget to like the Maggie Walker Art Dept. on Facebook!